In today’s world of pollution, adulterated and chemically treated food and drinks, stressful lifestyle, electronic distractions, erratic climate changes, it is very important for parents to focus on improving immunity in children to help them to grow up into strong, healthy and intelligent individuals. Suvarnaprashan Sanskar is one such method, mentioned in the classics, which imparts health and intelligence naturally. Suvarna Prashana also known as Suvarna bindu prashan is an unique Ayurvedic preparation that is known to enhance the immune power of human body. containing herbal extracts like vacha, brahmi, shankupushpi,all of which show strong immune boosting properties. Investing in improving immunity and developing intelligence in the early years is imperative for the wellbeing of the child. There is ample evidence that a child’s intelligence is not fully given at birth, but continues to evolve and change at least through the early elementary school years. Early childhood development is the key to a full and productive life for a child. Research has shown that half of the person’s intelligence potential is developed by age four and early childhood interventions can have a lasting effect on intellectual capacity, personality, and social behavior. Suvarna Prashana (Suvarna Prashana) contains pure gold in the form of ash and some other herbs that are known to enhance the immune power of the body. 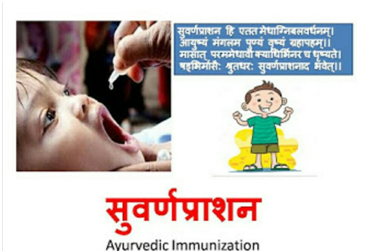 Administration of Suvarna Prashana (Suvarna Prashana) in recommended doses can help to build a strong Immunity and reduce chances of common infections such as cough, cold and fever. Suvarna Prashana (Suvarna Prashana) can improve attention and the grasping power in children. It is also known to enhance the memory. Suvarna Prashana (Suvarna Prashana) seems to be very important for improving brain health in children. Suvarna Prashan accelerates the process of digestion and hence improves the absorption of essential nutrients from food. Good skin is a sign of good health. Suvarna Prashan expels the unwanted toxins from the body causing total body de-toxification. It also improves the blood circulation which further results in improved skin texture and imparts glow to the skin. Suvarna Prashan can effectively reduce temper and tantrums. Due to its calming effects on mind, Suvarna Prashana (Suvarna Prashana) seems extremely beneficial in children with special needs such as autism, learning difficulties, attention deficit disorder and hyper activity. Suvarna Prashan improves the blood circulation in the body and also stimulates the nervous system, thereby leading to overall good physical and Mental Health. It is recommended that Suvarna Prashna should be taken on pushya nakshatra. Pushya refers to nourishment and pushya nakshatra is one of the most auspicious of the 27 nakshatras. The symbol of pushya nakshtra is the cow udder. If observed on the pushya nakshatra, the stars in the sky appear in an arrangement that that creates cow udder. Cow udder is associated with nourishment and so the Suvarna Prashna is taken on pushya nakshatra to get optimum nourishment and benefits. Suvarna Prashna can be consumed on any other day, however, the efficacy can vary and it may not be as effective as pushya nakshatra. Benign Prostatic Hypertrophy is one of the major clinical conditions related with ageing process in men. The primary symptoms of BPH those are due to the prostate obstructing the urethra include hesitancy, poor prolonged flow and sensation of incomplete emptying. Secondary symptoms are urinary frequency, urgency of micturition and urge incontinence. It also affects the quality of life and causes physical and mental stress to the patient. Usually associated symptoms are noticed from 60 years of age, and about 50% of men over 80 years have urinary symptoms associated with BPH. 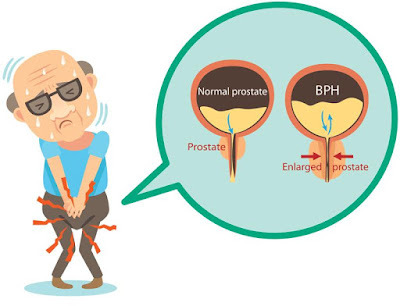 The primary symptoms of BPH those are due to the prostate obstructing the urethra include hesitancy, poor prolonged flow and sensation of incomplete emptying. Secondary symptoms are urinary frequency, urgency of micturition and urge incontinence. Patients may present acute urinary retention and develop a painful distended bladder. If retention of urine becomes chronic, the bladder may slowly distend due to inadequate emptying over a long period of time. This can be characterized by pain-free bladder distension and may result in hydroureter, hydronephrosis and subsequent renal failure. In addition to the mechanical effects of the enlarged prostate, clinical symptoms of lower urinary tract obstruction are also due to smooth muscle-mediated contraction of the prostate. Ayurveda describes two conditions known as Mootrakruchra and Mootraaghaata which are major conditions seen in Benign Prostate Hyperplasia. It also affects the quality of life and causes physical and mental stress to the patient. According to ayurvedic principles, vitiated kapha dosha is responsible for hyperplasia whereas smooth muscle contraction, hesitancy, poor prolonged flow, sensation of incomplete emptying, urinary frequency, urgency of micturition and urge incontinence are result of vitiated vata dosha. • Vata gets abated or invalidated when natural urges are controlled. Therefore, one should not control the natural urge of passing urine. Don’t hold on the urge to urinate. 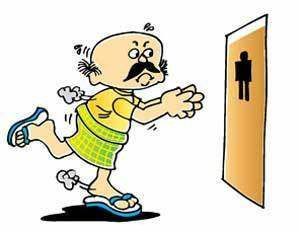 • Go to the bathroom even if you do not have urge. • Alcohol, tobacco, coffee increase vata and abate it and hence, should be avoided. • Vata becomes normal and not abate when the body is warm. Thus, Yoga as well as regular exercise can keep the body warm. • Mental exertion and stress leads to increase of vata. Avoiding mental stress and meditation can help to normalize vata. • Avoid foods which cause constipation as constipation exaggerates vata. • Long-term insufficient zinc intake is also linked to BPH. Good dietary sources of zinc include meat, eggs and seafood. 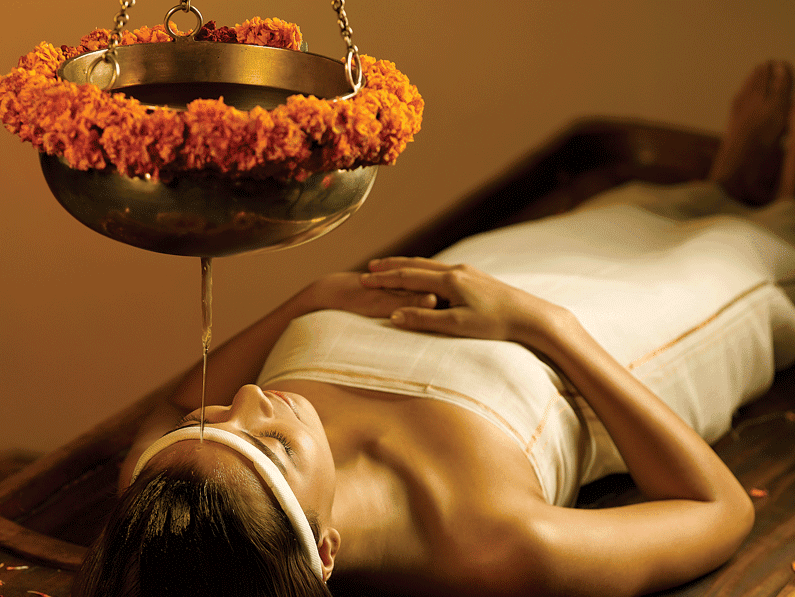 Pouring of a liquid on the forehead or scalp in rhythmic manner for stipulated time period is known as the Shirodhara. This is an allied Panchakarma procedure, which has got worldwide popularity because of its simple administration and efficacy in variety of disorders. Pouring of liquid on head in Shirodhara is designed to relieve the psychological stress and mental fatigue. Dhara is not only used in psychic disease but also used in psychosomatic diseases like Insomnia IBS (Irritable Bowel Syndrome), psoriasis etc. Acharya Vagbhata has considered it under the broad heading of Moordha Taila. This is a unique form of ancient therapy of pouring oil on the forehead from a specific height and for a specific period; continuously and rythematically with allowing the oil to run through the scalp and into the hair. Name of Dhara changes according to liquid which is used to do procedure i.e. if tail is used then it is called as TailDhara, if milk/ kshir is used it is called as kshir Dhara. Similarly TakraDhara if Takra/ butter milk is used. Pituitary gland is the master gland which controls all the endocrine functions in the body is located in the head. ShiroDhara controls the pituitary functions and in turn all the other endocrine functions. This helps in the smooth running of the body mechanics. 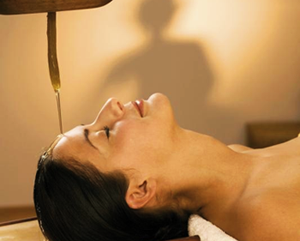 ShiroDhara also soothes the stressed and agitated mind and helps us to keep calm and at ease. This procedure helps in discharge of happy chemicals which helps us to come out of mood swings and live at peace. Proper posture of the patient for Shirodhara is supine position and Dhara Patra should be brought 4 inches above his head. The eyes and ears should be covered with cotton so that liquid may not enter in eyes. His head rests in slightly elevated position, preferably on wooden piece (Droni). Then warm oil is poured through Dhara Patra on scalp from 4 angula height (around 3- 4 inches). Dhara is allowed to run continuously through scalp & Dhara Patra is moved like pendulum starting from one lateral side of forehead to another lateral side in rhythmic manner. Oil used for Dhara should be Warm around 35 to 45celcius depending on season & prakriti of person. This procedure is performed for 45 to 60 minutes daily for minimum 7 days, it can be performed daily at same time for 14, 21 or 28 days regularly. 2. It decreases anorexia, increases sweetness of voice, softness of skin. 3. It is also helpful in Timira and Netra Roga, Shukra etc. 4. Dhatus are nourished, increases virility . 5. 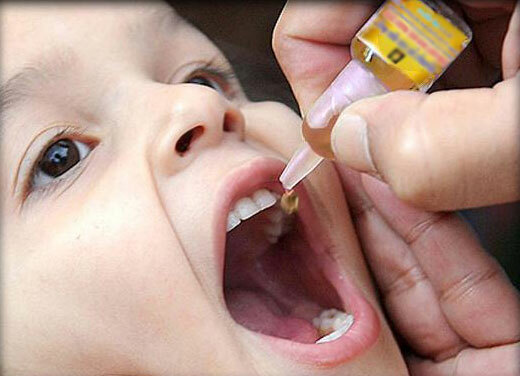 Excessive body temperature is reduced and patient can get good sleep. 6. According to Acharya Charaka, one who has his head well oleated daily does not get headache, baldness and grey hair. The strength of his cranial bones is markedly increased and his hair becomes firmly rooted and very black. The sense organs are toned up and the skin of the face becomes beautiful and the person gets good sleep and feels happy (Ch. Su. 5/82-84). 7. 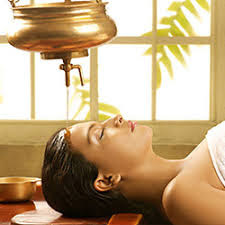 Mind, body and spirit are intimately connected in Shirodhara by calming the stressful mind & this procedure relaxes the entire physiology. 8. 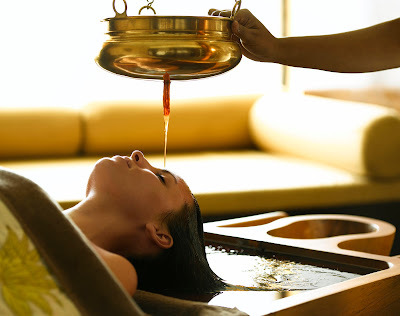 In Shirodhara liquid is poured on a forehead, which induces the somato-autonomic reflex through thermosensors or pressure sensors of the skin or hair follicles via the trigeminal cranial nerve and provides physiological effect of therapy . Insmnia (Nidranasha), Shirogata Vata, Shirahkampa .